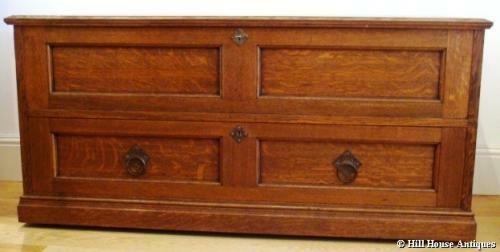 A rare & superb quality panelled oak Arts & Crafts coffer/blanket chest by Morris & Co (stamped marks); lift up lid to top and one long drawer below; the whole on its original castors. Cope & Collinson locks. c1895. Equally superb steel handles escutcheon. Approx 52" wide, 20" deep and 24" high. Very useful piece that can work in a hallway, landing, bedroom or sitting room!